Weird Wonderful Web: Piss you a merry Christmas! People drink a lot more at Christmas, which in turn means that they also need to pee more. Well as you can see, Santa is no exception. 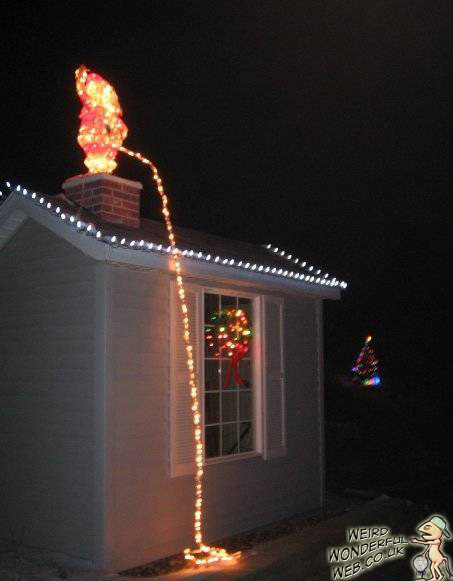 Not sure your pee is supposed to glow like that Santa. I know people have claimed to see "mummy kissing Santa Claus", but this may be further evidence of how far he actually goes when on tour! Neighbours to this house on being asked what they thought of the decorations said they thought this years effort was "piss poor".